Due to our landlord's personal use requirements, we had to move house. Therefore, the theater workshop is no longer available. Theaterwerk-Bodensee is now situated in Owingen near Überlingen. We are looking for a workshop/rehearsal room in Überlingen. 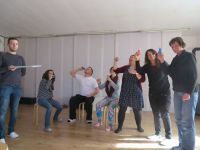 As soon as one is found workshops and rehearsals will be able to continue. Till then we will be working on site only.